I’m not much of a collector. Other than Legos, cats, and assorted piles of disorganization, I’m not very good at collecting anything. But if I were going to start a serious collection of something — and if I had unlimited cash — I’d probably collect swords. This is a patag, or patang. It’s from the mid-late 1800s and it’s Bhutanese in origin — though it was sold to me as a “Tibetan sword.” Granted, my grasp of the details of Himalayan political boundaries in the 19th century is not particularly keen, so I’m not really sure whether Tibetan and Bhutanese swords from the era can readily be distinguished. There are a couple of points that appear to be damage or imperfections in the wirework — including what appears to be a nail that might be securing the wirework to the wooden foundation of the handle. I don’t know whether that’s supposed to be there or not. I believe the wirework is genuine silver but I haven’t investigated too closely. 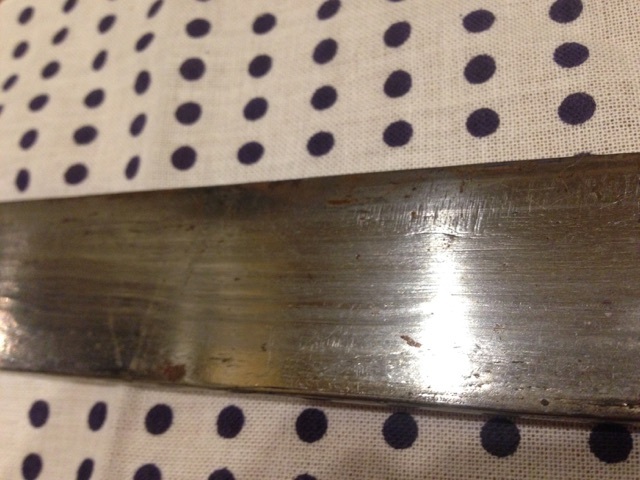 The blade is about 2 feet in length and has some rather pretty lamination. I haven’t attempted to clean up the blade at all, lest any cleanup work affect the patina. That said, it’s still decently sharp. The patang is clearly a chopping weapon, given the severely squared off configuration of the tip. My understanding is that this is the standard pattern for this type of sword. For a sword collection of one item, it’s not a bad way to start. Unfortunately, the collection hasn’t grown in almost 15 years and I’m beginning to lose heart. I’m not 100% sure that this item is Bhutanese rather than Tibetan, as mentioned above. But so far as I’ve seen, examples of weapons identified as Bhutanese tend to be more similar to this one than those identified as Tibetan. Here’s some examples and other findings. 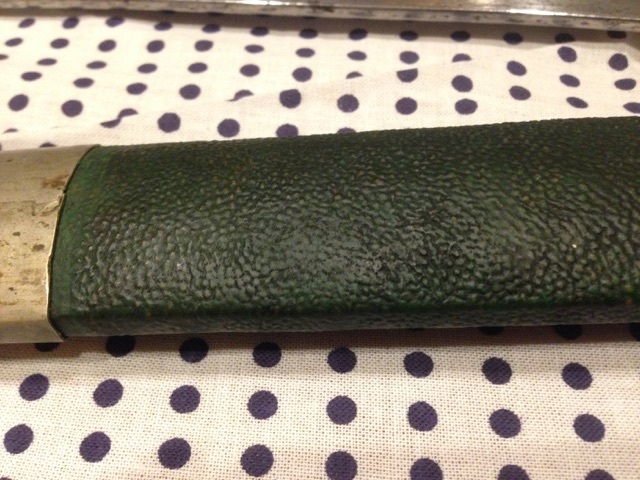 The scabbard of this item is a dead ringer for mine. The overall configuration of this one on display at the Met is very similar to my specimen, though this example has a metal scabbard and a less rounded-off tip. The Wikipedia page for patang provides some good background that might explain the variations in design, but it’s woefully light on specifics. I’ve definitely seen evidence that modern patangs look a lot like historical ones, including suggestions of intentional deception about weapon age. But I know a little bit of the provenance of this particular sword so I’m somewhat confident it’s authentically dated to the 19th century. I bought this weapon for $500 at an antiques fair in 2002 or 2003, from Charles M. Brown, the proprietor of China Trader Antiques in Marion, MA. The asking price was $850, but I think he saw my eyes light up when I spied the weapon and he severely dropped the price. He also kindly let me pay in installments of $100 a month. I paid him dutifully for two months, then forgot for a few months and then contritely sent him the balance in a lump sum. I still feel bad about that. Mr. Brown acquired the weapon in an auction out of Eldred’s auction house of East Dennis, MA., in July of 2002. The sale was for the estate of one Jane Culver Sargent. This was lot number 229 of the auction. The purchase price was $425 plus commission. So Mr. Brown did me a serious favor, pricewise. 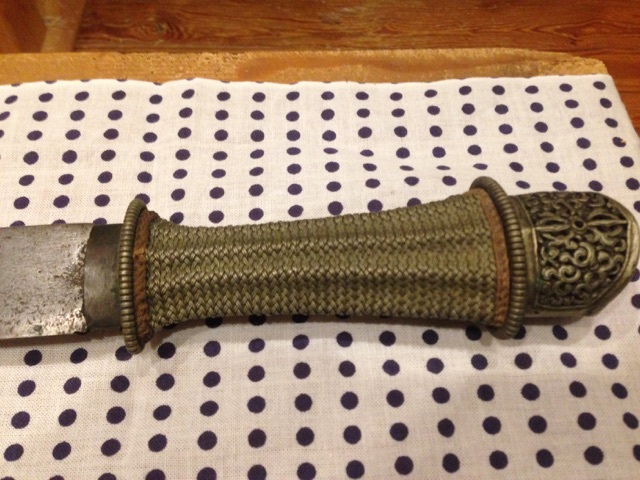 TIBETAN SWORD Late 19th Century With wirework handle. Shagris scabbard. Length of blade, 24 1/2″. 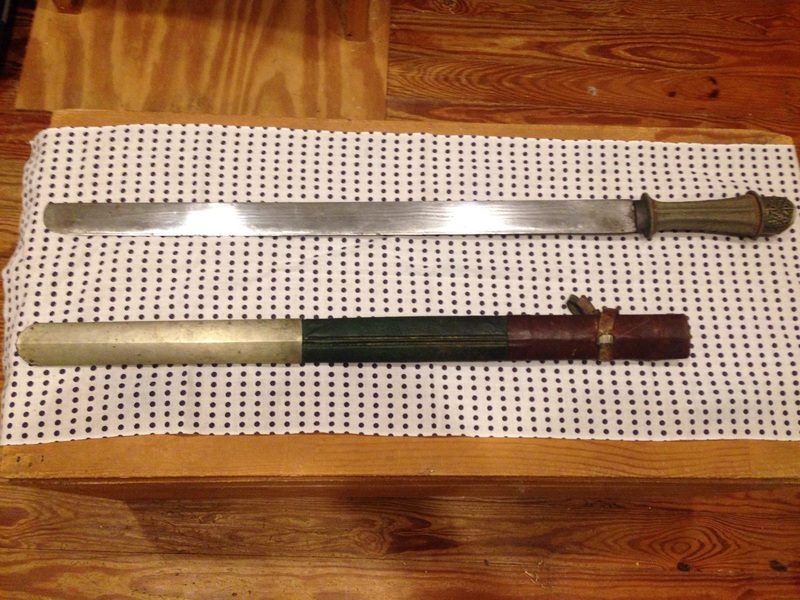 The low and high estimates for the sword are $250 and $350, which seems… pessimistic, especially in retrospect. Incidentally, I’ve seen similar swords on sale in the $1000 range here and there, though who knows what they actually end up going for. The estate of Jane Culver Sargent of Brookline was built on the collection of her father-in-law Porter Edward Sargent, who, prior to World War I, developed “Round the World School”. Between 1909 and 1914 this school was offered to the elite youth of New England. After graduation from secondary school, young men were taken on travels through the Middle and Far East by steamer. During these tours Mr. Sargent would offer classes in Oriental culture. At the same time he collected interesting pieces to illustrate his lectures and to bring home for friends. By 1925 when he purchased a large home in Brookline, he had a vast collection that so filled his home, that much of it had to be packed away. Many of the items were still wrapped in newspaper dating from the 1920’s when Eldred’s staff began their inventory. Although the provenance trail ends here (so far), the contextual evidence suggests to me that this item is the Real Deal. That’s my sword collection. Maybe some day it’ll actually be, you know, a collection.